Iranian cinema tends to be cryptic. Because of official censorship, Iranian filmmakers sometimes tell stories allegorically since they can’t come right out and say what they want. As rewarding as that can be, sometimes it’s often just tedious, especially when combined with a dry and slowly paced style of storytelling. Not so with The White Meadows. This Iranian film has rich allegory, amazing cinematography, unlikely landscapes, and a fast enough pace to keep you watching until the last surprising scene. Rahmat (Hasan Pourshirazi) travels a salty lake on his row boat, interacting with pockets of people in villages and towns. He comes to comfort the afflicted, and while they’re weeping, to collect their tears. His is there to “take their tears away,” he says. He gathers the tears in a little bottle, then funnels them into a bigger vase, which he keeps sealed in his satchel. His first stop is the funeral of a beautiful young woman. Then it’s off to a village where people are gathering to whisper prayers and petitions into glass jars — a spiritual ritual that doesn’t look very Islamic. Rahmat then goes to a virgin sacrifice — the young girl is to be set adrift in the salty lake. Along the way he gathers a follower — a boy in search of his father who was sent to the salt lake to work in the marshes. Later he collects an artist being sent to an island jail for failing to make his art the right way. At the end of his journey, when the vase of tears is full, writer/director Mohammad Rasoulof shows us just how all the collector’s labor and all that misery and heartbreak is spent. Whenever we make landfall, we’re always on a salt-encrusted, barren beach. Once, the beach is filled with dead birds. A blind man fetches them in a bucket. Nothing grows. Nothing is green. The sky is white or blue, and the land is white or sulfur-yellow. The only signs of life are in the black-robed wretches who populate the lake. The White Meadows makes you parched just watching it. The filmmakers surprise us with strange formations in the landscape — a cluster of wooden pillars, a flotilla of flaming bowls, a ladder from the surface of the lake to the top of the frame. At first these landscapes seems like inspired surrealist paintings. But then some drama will unfold, turning these unreal settings into everyday locales for the characters. Each vignette works as a believable portrait of an impoverished people — their rituals are vaguely primitive and superstitious, but still plausible. Yet think about any given encounter and there seems to be a subtext. The blind man collecting birds says that the water is too salty, that it first blinds the birds and then kills them. Did this man go blind from the salt? Tears are mostly salt water. By collecting them, will Rahmat be able rejuvenate the land? Is he gathering evidence? The artist is punished for failing to see color the right way. Everyone knows that the lake is blue, yet the artist paints it red. Yet if we think about it could we really say the lake is blue? Or would we have to say gray-white. The brother and friend who try to “help” the artist see correctly seem to be punishing him rather than helping... are they actually trying to help or are they “re-educating” him. And the boy in search of his father ... the movie plays a cruel trick and lets the audience know how close he came to finding him, yet not a single character in the film seems to have figured it out. In short, there is a lot going on in The White Meadows. There is a lot to think and talk about. And I haven’t even mentioned the eye-opening, surprising — outrageous if you think about it — ending. 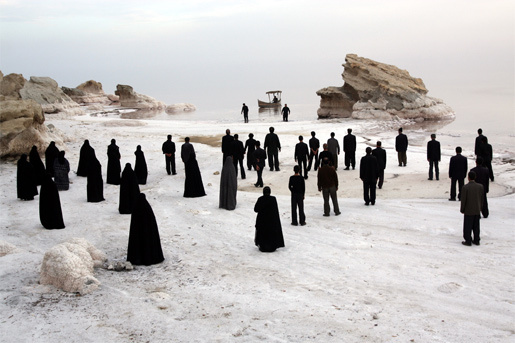 Some Iranian films deserve to be recommended with a grain of salt. Not so this one. See it with friends who like to talk about movies. Better yet, see it and then attend the panel discussion on Iranian cinema, November 11, 2010 at the 33rd Denver Film Festival. "Muhammad Rasoulof, one of the film-makers arrested at the same time, was also sentenced to six years in jail today."